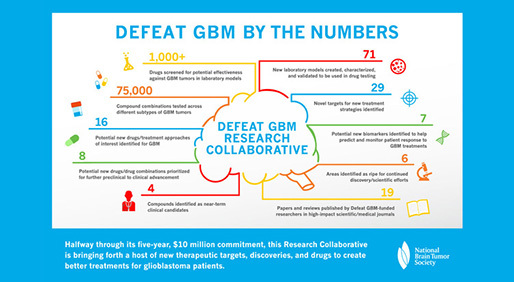 The Defeat GBM Research Collaborative is an effort based around three broad ideas: five years, $10 million and a question. The collaborative, a project of the National Brain Tumor Society (NBTS), is asking why the development of treatments for the brain cancer glioblastoma (GBM) has been marked by “heartbreaking disappointments and achingly slow progress.” It’s using its funding and timeline to find answers to that question — data that could, in turn, lead to new treatments. “The map of the genes that make proteins, and their alterations, in this cancer has largely been identified,” Paul Mischel, M.D., one of the collaborative’s leading researchers, said in an online statement. “So, one would expect or anticipate that this would actually make a difference in the lives of patients. But for a variety of reasons…that information has yet to really benefit patients,” said Mischel, a professor at the University of California San Diego and a lab leader at the Ludwig Institute for Cancer Research in New York. The collaborative aims to push past that notion to double the percentage of patients with “the most common, complex, treatment-resistant and deadliest type of brain cancer” who survive five years or more beyond their initial diagnosis. Along with its subsidiary – Cure GBM, LLC – the NBTS plans to reach that goal by stimulating teamwork among top brain cancer experts. Rather than making grants to individuals, the organizations fund collaborative, multi-institution programs designed to move drugs from the lab to the clinic. Much of that work is being done by three institutions serving as contracted research partners: MD Anderson Cancer Center in Houston; Memorial Sloan Kettering Cancer Center in New York; and the Ludwig Institute. Within these programs, researchers are working to better understand how GBM tumors protect themselves against existing treatments and where their vulnerabilities are. They are creating better models of these tumors for use in laboratory study and then testing experimental drugs against them. Now, at the halfway mark in its five-year plan, the society has issued a Defeat GBM progress report. *Generated more than 70 new lab models, known as stem cell lines and based on tissue from GBM patients, for use in preclinical drug screening. *When GBM is treated with drugs that attack the protein EGFR, the cancer may fight back by slowing production of another protein, Bim, whose job is to kill the diseased cells. Drugs that mimic the activity of Bim may help restore the body’s tumor-killing abilities. *GBM cells thrive with help from the nutrients glucose and acetate. Slowing the body’s production of these nutrients, and the tumor’s ability to use them, could help fight the cancer. *A new understanding of how GBM cells repair themselves after radiation makes this the right time to look for drugs that will make the cells more vulnerable to radiation therapy. *Depriving GBM cells of cholesterol may be an effective treatment. A drug of interest has been identified for study. *DNA is usually located on chromosomes, but in GBM tumors, many fragments are not; this could lead to new treatment strategies. *There may be new ways to treat GBM tumors that are driven by the loss of the tumor suppressor gene PTEN. *There are new opportunities for research now that there’s a greater understanding of the process by which the EGFRvIII gene mutation causes GBM cell growth. Furthermore, scientists have made discoveries about biomarkers that could signal whether GBMs will respond to certain treatments, or, once treatment is underway, how well the cancers are responding. According to the report, scientists involved in the Defeat GBM program have identified biomarkers that may indicate which patients will benefit from targeted drugs known as PI3K inhibitors, and from combinations of the targeted FGFR and CDK4/6 inhibitors. For patients whose GBM carries a mutation in the IDH gene, the scientists have figured out that using imaging to track a metabolite made by tumor cells may help determine, early on, whether IDH-inhibiting drugs are working against the cancer. Finally, they have found, testing a patient’s cerebrospinal fluid may be a less invasive alternative to conventional biopsy in determining how a tumor is responding to treatment. David Arons, chief executive officer of the NBTS and president of Cure GBM, LLC, said that the work of the Defeat GBM Collaborative is a reason for those affected by the cancer to have hope.